It is well worth taking the time to visit Sintra even if only on a day trip from Lisbon. It is a true escape for the heart and soul from bustling, noisy city streets. Approaching Sintra by train from Lisbon is the best way to appreciate why it has such a reputation for romance and jaw-dropping scenery. You could drive but it’s really a lovely train journey. 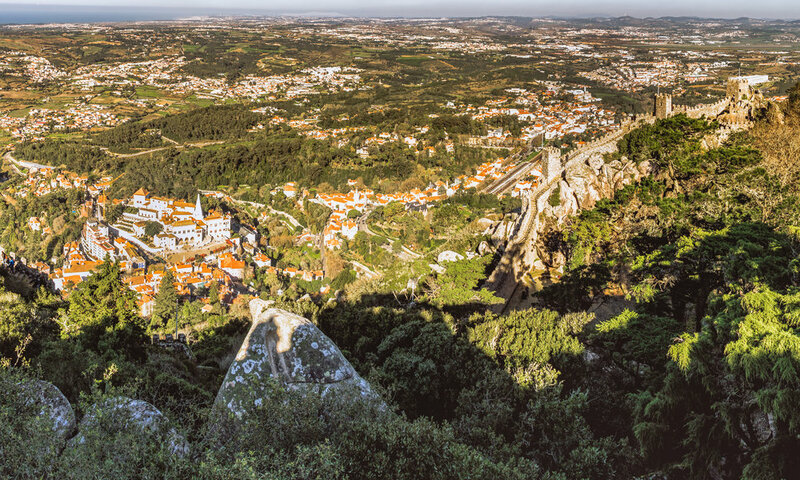 At first, the apartment buildings and urban sprawl of Sintra pass by the window just like any other major town or city in Europe, providing a glimpse of local everyday life. 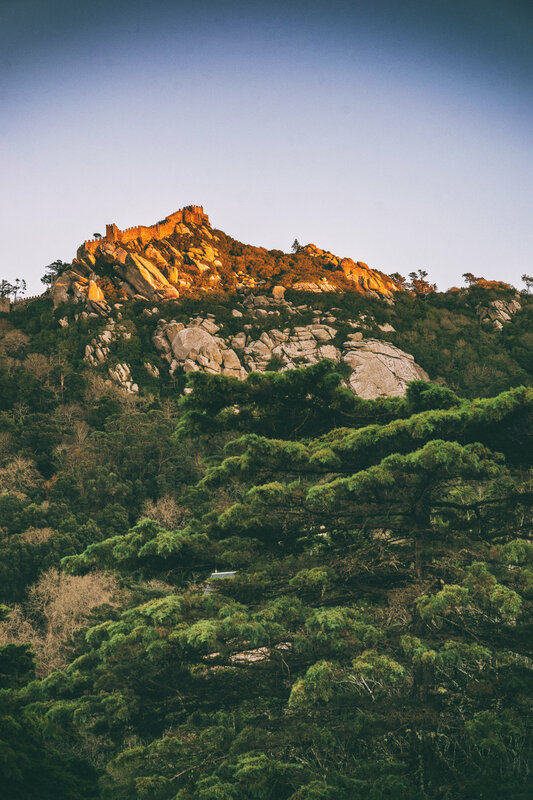 But as you get closer, those green forested hills you saw in the distance, moments before, turn out to be immense dramatic mountains that stretch down to cradle Sintra's centre of cobblestoned streets and beautiful old buildings. Inescapable for your eyes and impossibly high up, emerging from the rocky outcrop of the tallest peak, is an imposing castle, complete with towers and battlements straight out of a medieval fairy-tale. 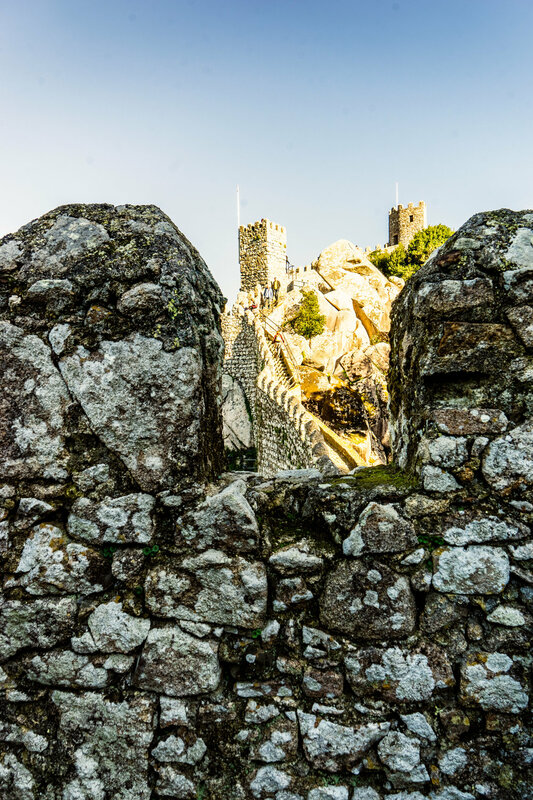 This is Castelo dos Mouros, the Moorish fortress built in the 8th Century to keep a watchful eye over the Portuguese coast and surrounding lands. Our initial thoughts were "even if we just get up into that castle, we’re delighted we came here"! 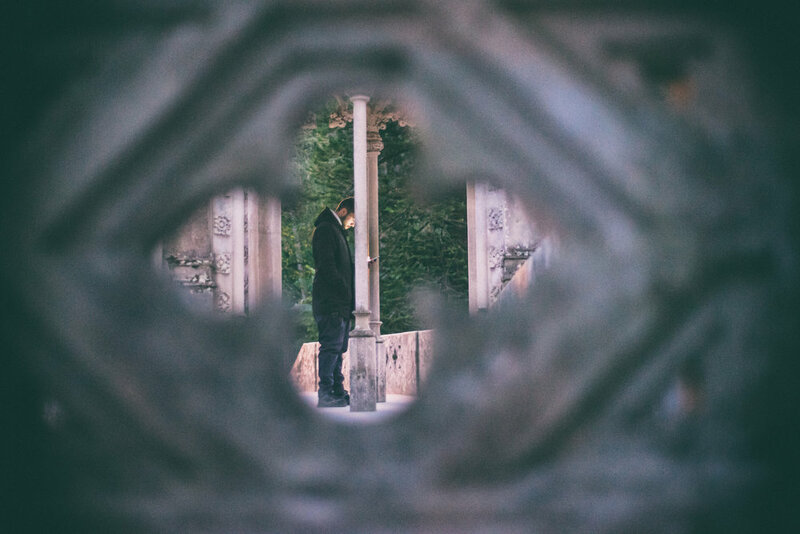 Yet it is only a scratch on the surface of what Sintra has to offer. A short walk from the train station into Sintra-Vila (Sintra Village), the sights and sounds of nature abound. 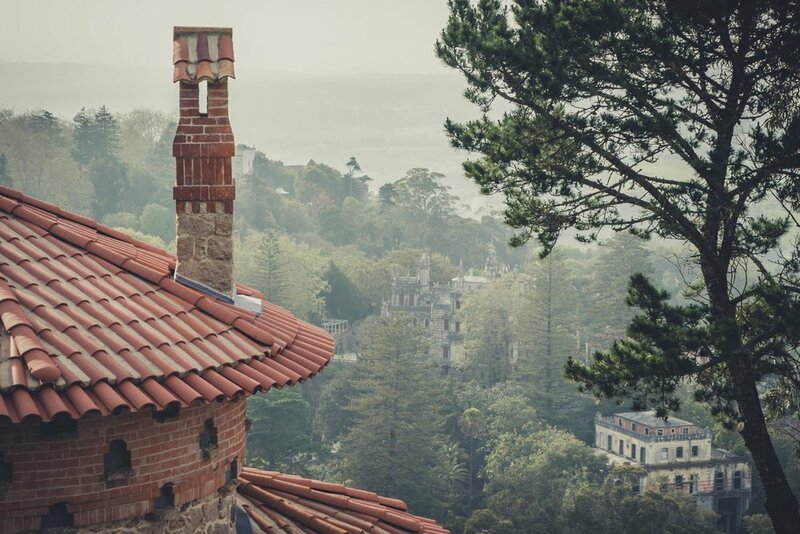 There are touts for rickshaws, private taxis and bikes to take you to palaces, castles and gardens but nobody hassles you - a clue to the peaceful and laid back mood of serene Sintra in the off season. However, we did return at the beginning of the high season when it was a lot busier with tourists with more hustle from the vendors and drivers. We’ve definitely been more hassled in other European cities so it’s really not too bad but the biggest drawback in the high season is the traffic. So, if you have the legs and the fitness, it is possible to walk to all of the sites but the hills are very steep and you have to make sure you give yourself ample time, as there is so much to explore. Take it easy, breath in the mountain air and get used to slowing down in order to take it all in! It really would be a shame to rush through any of it. With two or three days to spend in Sintra, it is absolutely possible to see everything and still feel relaxed. If you have only one day, however, then it’s best to get there early in the morning and hit the sights straight away. There is a handy bus route (no. 434) that runs all day between the train station, Sintra-Vila (Sintra Village), Castelo dos Mouros and Pena Palace which are the main tourist sites. Winding its way up into the mountains, this €5 bus journey lets you hop on and off in one direction although it’s a relatively easy and pleasant walk from Castelo dos Mouros to Pena Palace. 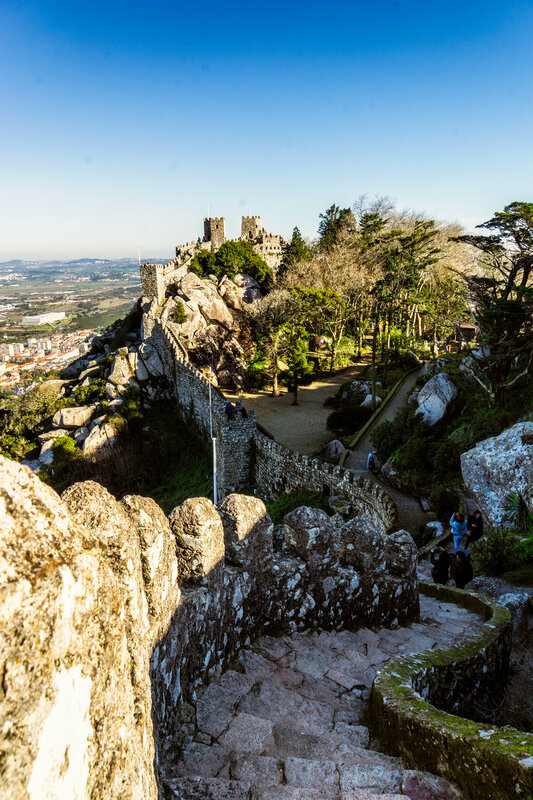 A morning walk on the walls of Castelo dos Mouros is sure to shake any Lisbon-related party cobwebs off from the night before! It offers outstanding 360 degree views of Sintra and the surrounds and all the way to the coast. Immerse yourself in its Moorish origins and crusader conquest, explained in the information posts along the ramparts and in each of its towers. Even though it has been extensively renovated, it feels like stepping back in time, 1000 years. The visitor’s centre provides refreshments and you can take the time to peruse the ancient artefacts that have been uncovered over the years. Don’t miss the ancient underground cistern which is purportedly the burial site of a Moorish king. Pena Palace is next on the route and again the views from its walls are eye-popping! The building itself is quite possibly the most Disneyesque sight we’ve have ever seen. Candy coloured walls, princess turrets, seashell covered gods that guard entrance ways and opulent royal living quarters that seem like they were only just vacated the other day! I really don’t think I can justify this place with words – it literally has to be seen to be believed. Sunset is a must here. The colours of the palace and its lush gardens are only enhanced by the golden hour and it’s very romantic. Don’t miss the mini-palaces for ducks and frogs in the garden’s pretty lakes. 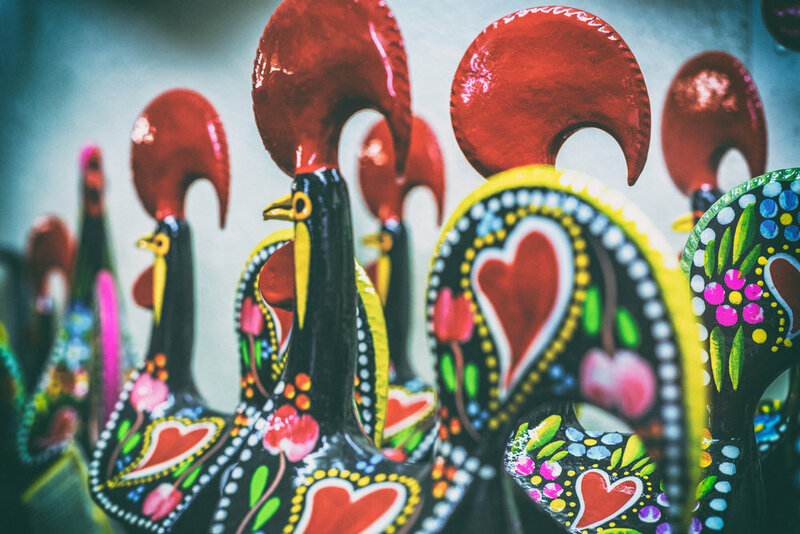 If you must leave Sintra that evening but looking for dinner after all that walking, then do flash a little extra cash (only a little) for Romaria de Baco – it is well worth it. 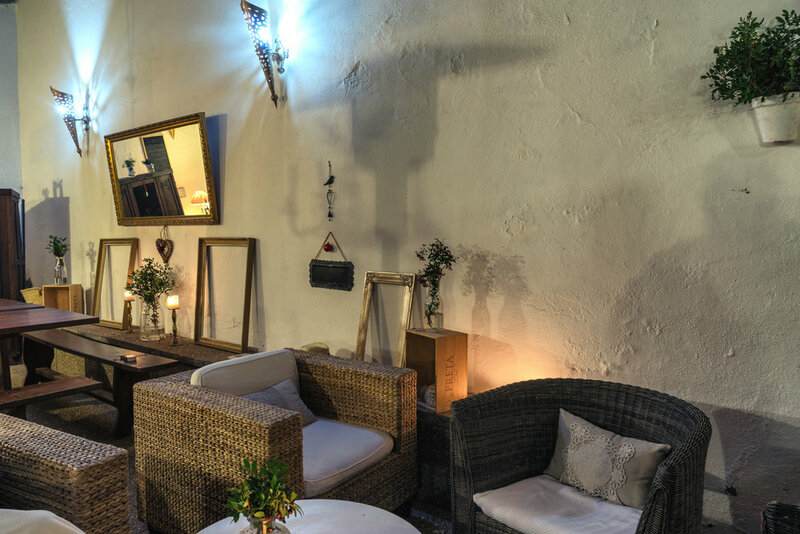 Delicious tapas-style food in an intimate setting with a wide selection of wines and ports, expertly selected for you by the friendly, helpful staff. 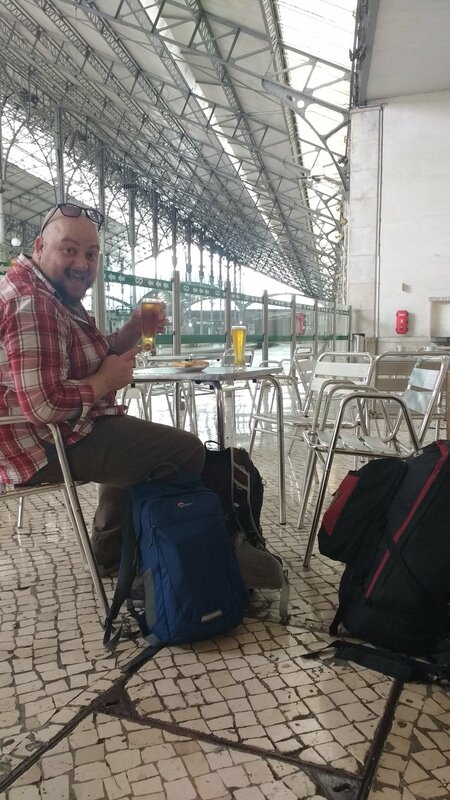 If you have time beforehand to grab a Super Bock (a thirst quenching Portuguese beer), head to Byron Bar, Cafe do Paco in the corner of the main square. It’s a cozy, family-run old-school bar which you could easily see Lord Byron himself quaffing a few in! Then get really sad and cry as you head to the train station to leave beautiful Sintra! If you’re lucky to be staying the night then explore the narrow quaint streets around the village and keep an eye on the castle lit up against the star-strewn sky after dark. In fact, after dark the whole village is eye-catching, especially the National Palace of Sintra, bathed in soft light. 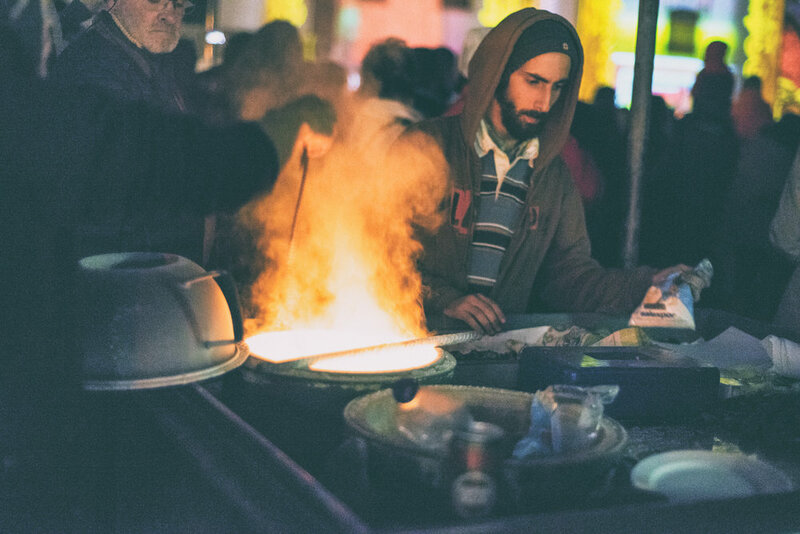 In December, the whole village was gearing up for Christmas with plenty of vendors selling roasted chestnuts in and around the main square that hosts a brilliant festival display. Accommodation options are wide-ranging from hostels to five-star hotels. We stayed in a lovely little guest house, Sintra Center Guest House and it was truly a little slice of heaven. Only around a fifteen minute walk from the village down into a sleepy rural valley with stunning views of the castle above, we were welcomed warmly by our host and instantly at home in the lush surrounds of the guesthouse gardens. Lulled to sleep by the sounds of the nearby stream in a beautifully decorated en-suite bedroom and waking to home-made bread, yogurt, honey and jams and free-range eggs for breakfast. It is a small place so booking in advance is recommended, especially in high season. On our return trip we stayed in the Moon Hill Hostel after a disastrous Airbnb booking that we simply couldn’t stay in (damp, black walls and unclean sheets!). The Hostel is bright, clean and beautifully decorated. Our double room had a huge comfortable bed with a view of Castelos dos Mouros, high above the village and Sintra National Palace. Every morning, a filling breakfast of eggs, cheese, fresh baked bread, orange juice and plenty of fruit and yoghurt was laid out for guests and it was a perfect start to the day. The staff are super friendly and helpful and the price of €50 per night for two people was very reasonable, especially for April. The location is perfect too with easy access to the town and only a short walk to one of the highlights of any visit to Sintra. 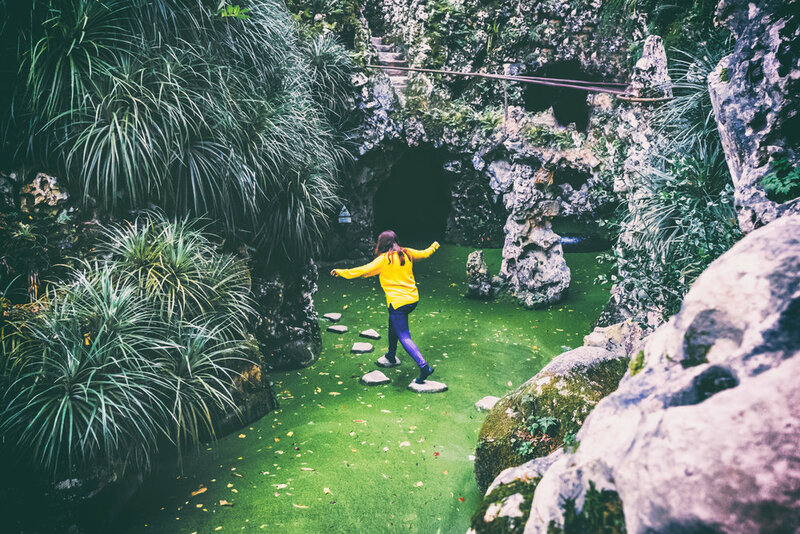 Quinta da Regaleira is a must-see and is thankfully only a short ten minute walk along the main road out of the village. It is a vast estate of secret gardens, hidden underground caves, mysterious grottos, magical pools and Gothic towers that serve to enhance the intricate and ornate architecture of the estate’s extravagant villa. The initiation well at the centre of the complex is on the wish list of an increasing amount of photographers and I would speculate is the highlight of the estate for most visitors. It can be approached through a series of underground walkways or from the secret entrance-way above ground, following its moss covered stone stairwell, winding 27 meters down to the pink and white tiled floor depicting a Rose Cross. The inspiration for its construction is supposedly Dante’s nine circles of hell and was used in masonic rituals during the 20th Century. Whether you emerge into the light or the darkness from the well there is plenty more to explore in both directions and it's worth trying both! Secret trails, hidden benches with tantalising views and an avenue of renaissance statues to the Greek gods combine to leave you filled with wonder. We unfortunately didn’t get time to get inside the villa itself but by all accounts it is said to be equally inspiring. However, revisiting Portugal has become a bit of a habit for us at this stage, so on our return visit to Sintra we couldn’t resist a second look at Quinta da Regaleira. We did go inside this time but we weren’t hugely impressed and only because we feel like seeing the inside of Pena Palace, satisfied our curiosity about palace life! We much preferred spending more time in the gardens. It was much busier in April than it was the previous December but Neil still managed to capture stunning photos of the beautiful grounds and of course springtime made all the difference to the gorgeous flowers on display. 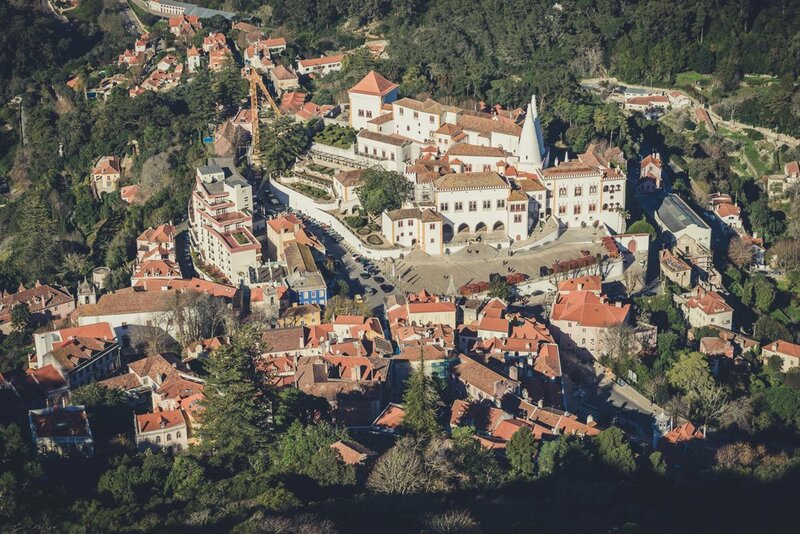 Sintra’s hidden gem - Convent of the Capuchos. The sweetest thing about returning to a place you love is the chance to explore further afield. 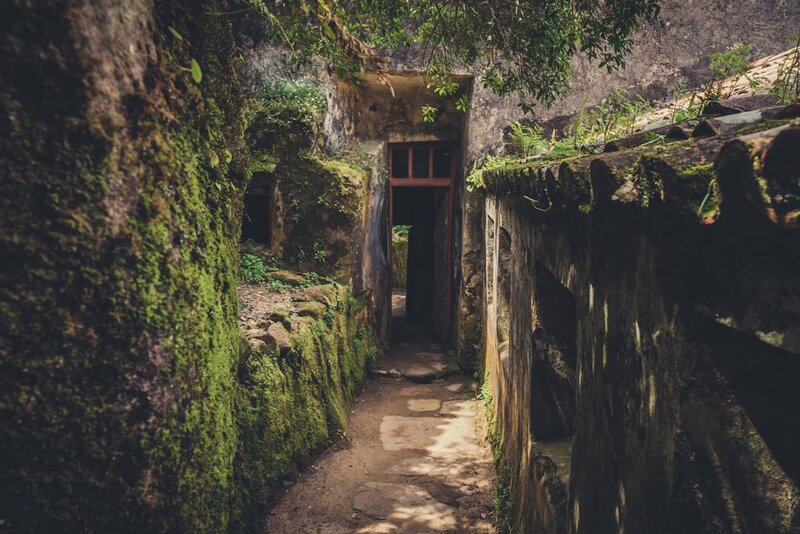 We knew we wanted to get to see the Convento de Santa Cruz da Serra da Sintra (Convent of the Capuchos) but we had heard it’s not easy to get to. With no public transport, most people were advising to get there by hiring a car or renting a bike. The former was too expensive and the latter was way too hard for us to consider. 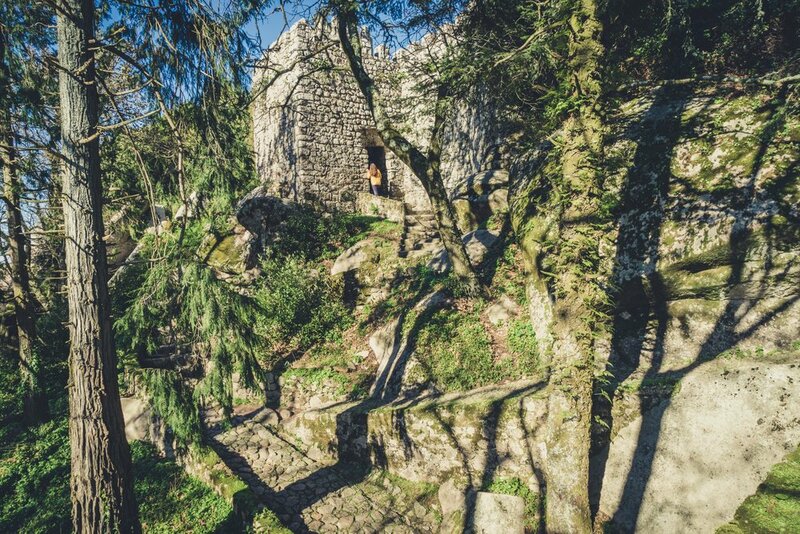 The Convent is located high up in the Sintra hills about 7km from the centre of Sintra so it could certainly be reached by walking or cycling. Not by us though! When we left the gates of Quinta da Regaleira we spoke to a nice local girl with a tuk tuk and she offered to take us there for €20. We debated about whether to ask for a return price but we decided in the end we could walk back down from there. At least it would be downhill! The tuk tuk struggled up the hills and at times we thought it wouldn’t make it but she got us there safe and sound. It was actually a really interesting, if noisy, journey and we were dropped right to the gates. The entrance fee is €7 per adult and you get a handy little map of the complex. We were surprised to find a little café at the visitor’s centre but we had brought our own picnic of bread, cheese and oranges. We headed for the picnic benches in among the beautiful old trees with a carpet of wildflowers beneath our feet and enjoyed the birds singing and the cool, mountain air. Because of its location, the Convent is way off the tourist radar, especially for day trippers. The natural beauty and pure tranquility of the place is worth the journey though, whatever way you decide to get there. The start of the loop walk is in the Courtyard of the Crosses with a huge moss covered boulder serving as the Convent’s gate. As you make your way through you can’t help feel strangely spiritual, even if you’re not religious. The connection with nature and the efforts that were made to incorporate as much of the natural world as possible into the architecture is palpable. Huge granite walls and cork trees pretty much form the foundations of the buildings. Everything seems to be growing from the earth with the interiors all lined with cork as a natural insulator. The simple lives that personify the Order of The Capuchins are portrayed here in the eight tiny cells the monks were quartered in, along with the Order’s belief in the harmony between human and divine works (the natural world). Their dedication to the conservation of the woodland around them, up until their departure in the mid 19th Century, has essentially protected a rare ecosystem and is now an extremely important natural asset for the country. Big old oak and chestnut trees and of course the famous cork trees surround the Convent and a lovely nature trail has been incorporated into the surrounding forest. It’s well worth it and it leads up to a spectacular viewpoint where the monks went for meditation. All told, we spent about 2 hours exploring the whole place, luckily mostly by ourselves, with very few other tourists about. Definitely add it to your list if you have a few days in Sintra. We headed out of the main gate and turned left to head back to town. The tourist officer at the gate said it would only be about a half hour walk. After half an hour had passed, with no sign of getting anywhere near home, we got a little bit worried! But we were really enjoying the walk. The sun was out and we had plenty of water so we didn’t complain. After another half an hour we came across a large estate with a wall around it and it turned out to be the grounds of Pena Palace. We were delighted! We found a way in and meandered through the lush woodland and enjoyed a second visit through these gorgeous gardens and another chance to take photos during the springtime bloom. On the other side we thought we might as well keep walking as we were curious about the trail into town from the Palace. We were surprised at the energy we had to keep walking. It was just so beautiful and peaceful, walking through the trees, stopping off at lovely little waterfalls and viewpoints. 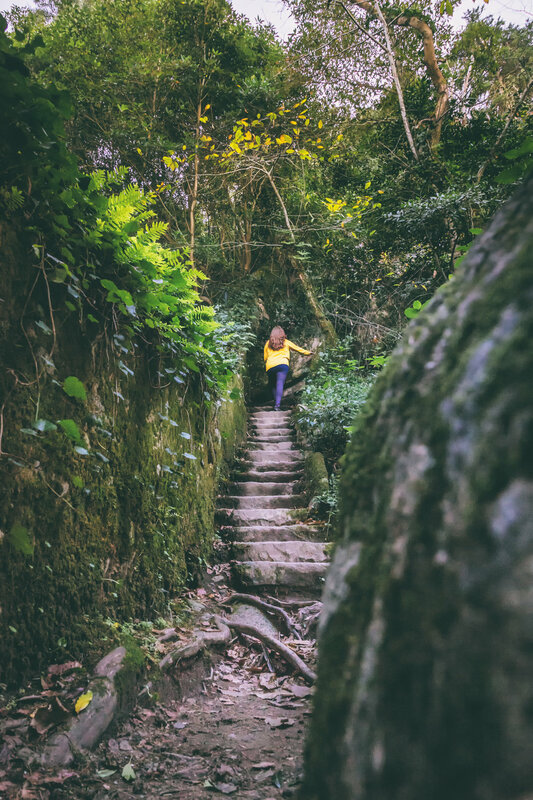 The trail is very well maintained and easy to navigate and there were quite a few people heading up and down to the Palace from Sintra so it’s definitely something to consider if you’d rather not sit on a bus. When we finally got to the bottom of the trail we found a tiny bar with a terrace overlooking Sintra and it was the perfect way to rest our weary legs. We were lucky to just catch the place before it closed. We ordered a drink and chilled out with the sunset and the beautiful views before heading back for a lovely hot shower at the hostel. We couldn’t have asked for better end to our last day in Sintra. We loved being back in Sintra and we were so glad we got to revisit our favourite places and visit some new ones. 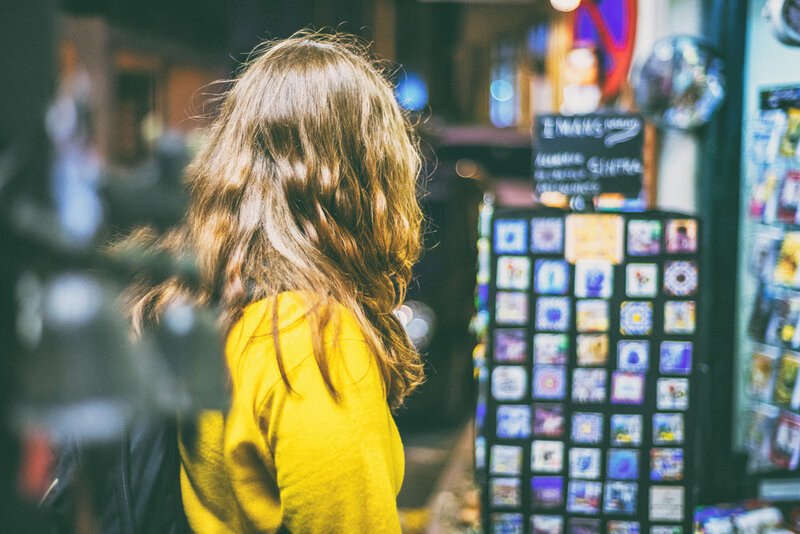 Like us, if you just can’t bear the idea of going home straight away, then take the bus to Cascais along the coast and get the train from there back to Lisbon. If you have the day, you really should, it’s a great way to squeeze in a visit to a stunning seaside city and spectacular coastal views at Cabo da Roca. If you need more convincing, click here.